NEW YORK — Stocks slipped in Friday morning trading, as falling oil prices dragged down energy companies, but the S&P 500 remained on track to close out its third straight winning week following a brutal December. KEEPING SCORE: The S&P 500 was down 14 points, or 0.6 percent, at 2,582, as of 10 a.m. Eastern time. The Dow Jones industrial average fell 155, or 0.6 percent, to 23,846, and the Nasdaq composite lost 44, or 0.6 percent, to 6,942. CRUDE CALL: Energy stocks in the S&P 500 fell 1 percent for the largest loss among the 11 sectors that make up the index. Exxon Mobil, Chevron and ConocoPhillips all dropped more than 1 percent. Benchmark U.S. crude oil fell 81 cents, or 1.5 percent, to $51.75 per barrel and on pace to break a long winning streak. Oil has climbed for nine straight days, as it recovered a portion of sharp losses from prior months when worries flared about weakening demand and too much supply. Brent crude, the international standard, sank $1.07 to $60.61. If it remains down, it would be the first drop for oil in two weeks. 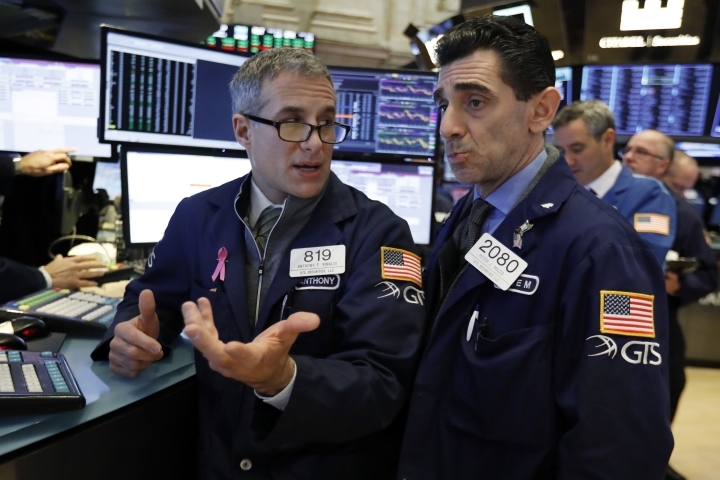 2019 RELIEF: The S&P 500 has been clawing back gains since running to the edge of what traders call a "bear market," when it dropped 19.8 percent between setting a record in September and a low on Christmas Eve. Stocks have climbed on soothing words from the Federal Reserve about the future path of interest rates, plus hopes that the U.S.-China trade dispute may ease. That's helped to at least paper over worries about slowing growth for corporate earnings and the possibility of a looming recession. Even with Friday's weak opening, the S&P 500 is on pace for a 1.9 percent gain this week. It would be the third consecutive winning week for the index, its longest since August. Not only that, the last three weeks of gains have all been of at least 1.8 percent. If that holds, it would be the longest such streak since 2001. US-CHINA TALKS: Talks between American and Chinese negotiators may have ended without significant breakthroughs, but traders are choosing to focus on the positives. The fact that talks lasted a day longer than planned, conciliatory statements from both sides and the possibility of higher-level talks in the near future are driving gains in Europe and Asia. In December, U.S. President Donald Trump and Chinese leader Xi Jinping agreed to a 90-day tariffs cease-fire, for negotiators to soothe tensions that have unsettled trade. MARKETS ABROAD: In Asia, Japan's Nikkei 225 index jumped 1 percent, the Kospi in South Korea rose 0.6 percent and the Hang Seng in Hong Kong gained 0.5 percent. In Europe, France's CAC 40 dropped 0.6 percent, and Germany's DAX lost 0.6 percent. The FTSE 100 in London fell 0.4 percent. INTEREST RATES: The yield on the 10-year Treasury note fell to 2.68 percent from 2.73 percent late Thursday. The Budget Report seeks to provide comprehensive coverage and analysis on the current economic, financial issues around the world. First hand finance and economic news all day, every day. Copyright © 2015 - 2019 The Budget Report. All Rights Reserved.